If you’re going to Greece and you’re looking for a place to party, then Laganas is the place. It has various bars, clubs, beach bars and places for entertainment. It is the only town in Zakynthos to offer such a variety of nightlife. Laganas attracts mostly young people – either studying or already graduated. The average age for the travellers in Laganas, Zante is around 20. The majority of tourists come from the UK. Most of the attractions are fit to UK residents. For example, all of the artists performing live in the clubs are British. Every TV in the restaurants broadcasts British TV programs. Most of the employees in restaurants, bars, clubs are from the UK as well. Zante clubs had a different policy for entering during this summer of 2017, compared to the summer of 2016. What is more, a new club has opened called “Bubbles”, which despite hosting various events and parties, also features bubbles made from foam coming out of special machines which fill up the main street. This year, the notorious club “Cocktails and Dreams” had placed an entrance fee of 5 euro for the bar below, which last year was free to enter. All the more, the upper floor of the club used to be free to enter if you bought a shot from the bar below, which cost 50 cents. 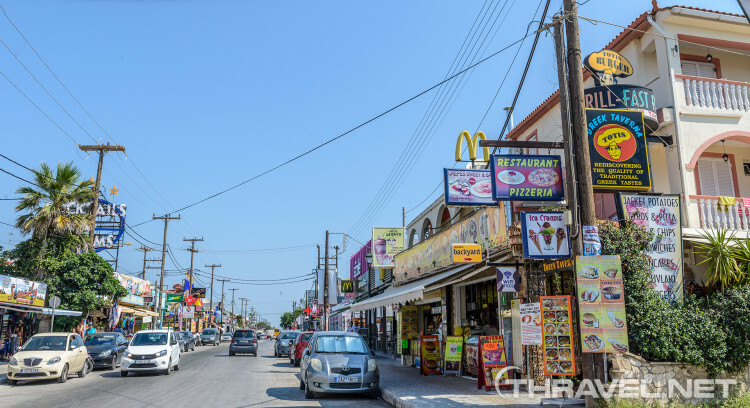 Now, however, the upper floor is reserved for tourists with wristbands that can be purchased from the Zante Box office or at the cashier on the lower floor at the bar for 30 euros. This came as a surprise to us as it is quite expensive, however, if you manage to become friends with one of the bouncers, you might have luck in getting in on the upper floor. The prices of the drinks remained the same in all of the places. Also, the other clubs seemed to sustain their policy of entry and are free most of the nights, except when there are organized paid events like paint parties or glow parties. Nevertheless, the atmosphere in Laganas, Zakynthos still remains and the parties are still as great, regardless of the change in entrance fees. Laganas boasts a variety of clubs that offer music from different genres. The first club that we got to explore was Waikiki which is close to the beach. It opens at different times during the week. The entry fee was 5 euros and included a free drink of your choice. The venue itself was a small room with no places to sit. There was a bar that took up most of the space and a place to dance. Our first impression was how stuffed the place was. It was incredibly muggy as there was clearly no ventilation so everything smelled of cigars. The music was all right but again focused solely on what the tourists from UK would like. There were a lot of drunk people but overall the atmosphere was good. There were guards that monitored who came in. Most of the bars in Laganas have a club entry to them so whenever you feel like taking it to the next level you just have to go one door further into the bar. Waikiki was just a club but Rescue, Zero and many more were both a bar and club. The second club we went to was Rescue. It was empty almost every time we went in it during the course of one week, except when they hosted an event such as a Paint Party or Glow Party. We never got to stay there more than 5 minutes as it just didn’t fill up enough. We did, however, very much enjoy the bar. The entry to the club was free as long as there was no event hosted there. However, if there is an event you’ll have to pay 20-40 euro depending on the event. Zero is one of the clubs that we frequented during our stay. It had a bar to it but the club attracted more people than the bar, opposed to Rescue. The prices in Zero were particularly high compared to other clubs in the area. Because of that, we always bought drinks from another place and went to Zero just to party. This brings us to the club Cocktails and Dreams which is also on the main road. It offers two floors – one opening before 12 and having a free entry, and the other opening after 12 and having a “paid” entry. To begin with, this club had the lowest prices for alcohol while maintaining a certain standard. The cocktails were all 2,50 euros and the shots were 50 cents. We do not recommend getting vodka or tequila as they are very cheap and bad quality. We did try the B52 shot which is made from Baileys, Kahlua and Grand Marnier and we loved it. It is best to order drinks from the top as we observed that they pour from branded bottles there, unlike on the lower floor. The entry situation was very complicated as there are no instructions or guidelines for one to go to the upper floor. We understood from the staff that we had to buy a drink from below, show it to the bouncer and then this serves as a ticket for upstairs. However, when we did that the first time, the bouncer told us to go away. Another time we managed to go up without paying anything and without getting a drink. We believe that was because it was rather early and the bouncer let everyone in just so he can fill up the place a bit. One time we had a drink but there was a huge crowd in front of us and we couldn’t get through it. The bouncer saw our drink, indicated us to come forward but we couldn’t pass all the people. They even spilled our drinks all over us. We were so frustrated that we left. The atmosphere in Cocktails and Dreams club was by far the best we’d experienced but it was not worth the struggle to go on there. There is absolutely no control over who gets in and when and the people that actually follow the rules don’t necessarily make it. Not to mention, the bouncer was extremely impolite and even physically assaulted some men and women. He shouted and pushed them down the stairs to hurry. There is this thing called “Laughing gas” that many of the tourists enjoyed. According to the staff that we asked, it makes you feel drunk for a certain period of time. Apparently it is not at the same prices everywhere. If you care to try it – it costs 1 euro in the more distant from the main road bars, 2 euro in most of the clubs and bars on the main road, and 3 euro in a couple of cafes and clubs such as Zero and Medousa Shisha Bar. Since we haven’t tried it ourselves, we cannot claim whether there is a difference in quality at the different prices but we assume that there is not as all of the balloons that were filled were from the same machine. As mentioned above, during holidays to Zante, there were various bars to choose from. The busiest was Rescue. It offered a DJ and many people went there to warm up for the night. The price of a B52 shot there was 3 euro and the price of a beer was 4 euro. We really enjoyed it there. We also got to visit Medousa Shisha Bar which offers both drinks and shisha. It had a very polite staff and quality services. They served us complimentary shots. Their shisha was 10 euro. We never got around to going to beach parties and to beach clubs. These are the places that frequently host events. They do, however, only work till 11p.m. For the events held in clubs such as Rescue and Zero, you can get tickets right before the event starts from the employees upfront. However, for the events in Pure, you can only get tickets from the Zante Box Office which is on the main street. Most of the events were quite expensive for what they offered – from 20 to 40 euro per person. We didn’t think it was worth it so we just went to regular clubs.